I live in Round Rock TX. I would like to plant Irises and have failed before. What type of irises grow best here? When should I plant them and should I add something to the soil to help them grow? Let's talk first about native or non-hybridized iris. There are 26 irises native to North America in our Native Plant Database. Of these, only 4 were shown to be found in Texas. Most of them seemed to favor the West Coast, or cool, wet areas. The four irises tough enough to grow in Texas are Iris brevicaulis (zigzag iris), Iris fulva (copper iris), Iris hexagona (Dixie iris), and Iris virginica (Virginia iris). But, perhaps you were thinking of the Iris germanica, bearded iris. 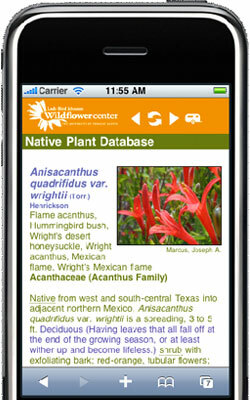 This USDA Plant Profile link refers to the I. germanica as "introduced"; that is, not native to North America. The USDA Plant Distribution Map at the same web location does not show Texas as one of the states where it is distributed. Of course, we know that many gardeners grow it here, but that perhaps gives us a clue to why it seems hard to do so. This site from Floridata will give you more information on the culture of I. germanica. It apparently began as a natural hybrid between I. pallida and I.variegata. Iris germanica is thought to be native to Southern Europe and the Meditteranean, and other species from Europe and Asia have been brought into the breeding, but it has become established all over the temperate world and can be found on road shoulders and old home sites throughout much of the United States and Europe. There are literally thousands of different irises, many of them with commercial cultivar names. Now, we begin to see the value of using native plants, as promoted by the Lady Bird Johnson Wildflower Center. When you are dealing with a hybridized and/or non-native plant, you have no idea what characteristics it has bred into it, nor of the ideal way to grow it. With plants native to the area in which you are gardening, you don't have to make as many adjustments in water, fertilizer or even soil content, because you likely already have good conditions for the native plant to flourish. April 24, 2015 - I need your suggestion for a groundcover for a flower bed in the sun and in the shade in Oklahoma.